Please RSVP your attendance at the exhibition by navigating to this link. Admission is free for all events during the festival. – 9PM – Cafe Mash, live performance by musical band “Suspenders”. 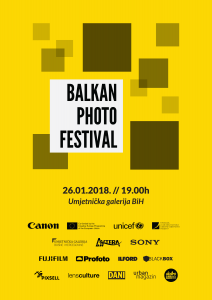 This year’s Festival is supported by: Creative Europe, UNICEF, Foundation for music, performing and visual arts Sarajevo, National Gallery of Bosnia and Herzegovina. The contest general sponsor is Canon Bosnia and Herzegovina and golden sponsors are Avtera BH and Sony Bosnia and Herzegovina. The contest is also supported by the following sponsors and friends: BlackBOX, Profoto, Fujifilm, Hotel Festival, Ilford, FAN Ferhatović i EUROBHPLAKATBH. Apply to participate in PROFOTOmaraton!